Replace Multiple Teeth or an Entire Arch Today! Tooth loss doesn’t only affect your ability to chew, speak or smile around your family and friends. It can also cause dramatic shifts in your bite and make neighboring teeth drift into the open spaces of your mouth. By replacing your teeth through restorative treatments like complete and partial dentures, you can not only get your smile back, but feel confident when performing basic tasks you rely on every day. 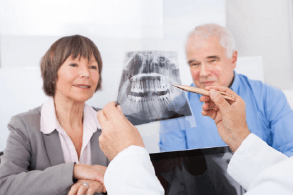 To get started creating your new denture with any of our highly qualified dentists, contact our Salinas office today! It doesn’t matter if you’re missing a handful of teeth or an entire arch, dentists can easily replace teeth in both circumstances. Those who feel self-conscious about smiling because of tooth loss can largely benefit from a prosthetic dental device. If you’ve ever stopped to look over a menu while out to dinner just to see if you can eat any of the food, dentures may be right for you. Maybe you’ve decided to forgo going out for meals entirely because of your tooth loss. In other cases, people may need multiple tooth extractions due to extensive dental disease or trauma. 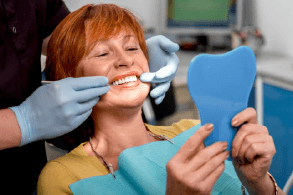 After your teeth are extracted, you may want an immediate denture placed so you can still keep your smile while the permanent version is created. Dentures come in two main forms: complete and partial. Complete dentures are intended to replace all teeth, whether it be one arch or both. They utilize a gum-colored base and porcelain teeth in order to provide the most natural appearance possible. They’re held in place by natural suction and customized to fit the shape of the mouth. During the first few weeks of wear, denture adhesive may be utilized to provide additional support, but is not meant to work as a long-term solution. Partial dentures are meant to replace multiple teeth, whether they be consecutive teeth or not. This largely distinguishes them from traditional bridges, which are exclusively for replacing consecutive teeth. 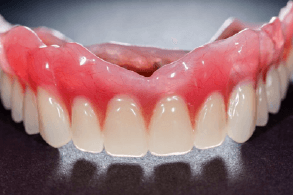 Partial dentures also utilize a pink-colored base connected to a metal framework, This framework is meant to hold the denture in the mouth. Keep in mind that both complete and full dentures are designed to be removed for cleaning and maintenance. To keep your denture clean, start by purchasing a soft-bristled toothbrush and non-abrasive denture cleanser. Avoid using whitening toothpastes or at-home cleaning supplies which can easily damage dentures. Try to clean your denture after every meal and at the very least twice a day. When cleaning your denture over the sink, place a towel in it first in case you accidentally drop them. This way they won’t get damaged from the fall. Focus on the many crevices in between teeth and on the palate to remove food debris. Once cleaned, allow them to soak in water when not in use. Never use hot water to soak or clean dentures as this can permanently change their shape and make them unusable. After cleaning them, make sure to clean your mouth’s many surfaces as well; plaque will still build up on your gums, cheeks, tongue and soft palate. 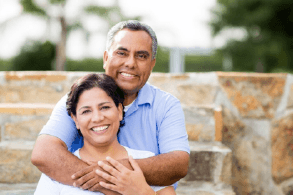 When you visit Blanco Circle Dental Care, a dentist in Salinas will make sure you receive a denture that fits your mouth comfortably and effectively for many years to come. To get started replacing your smile, contact our office today!